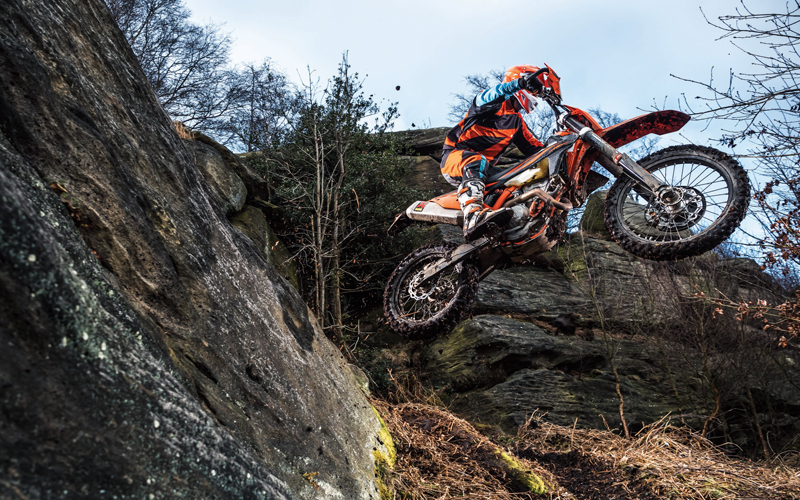 The combination of cutting-edge 2-stroke engine incorporating TPI electronic fuel injection and a lightweight, extremely agile chassis make the KTM 250 EXC TPI the first choice for hard enduro events. As a result of having an electronic oil pump, lubrication is automatic, so that fuel and oil no longer have to be laboriously mixed by hand. In addition, acquisition and operating costs are low compared to 4-strokes, making this bike a unique proposition. The 2-stroke engines from KTM with displacements of 250cc and 300cc are very much in demand by Enduro riders because ultimately they deliver the best possible performance in their respective classes. For model year 2019, KTM will continue to expand its leading position in these areas – as a result of the revolutionary TPI electronic fuel injection, the engines work more efficiently than never and are ecstatic to ride with their outstanding performance. It's no surprise then that the KTM 250 EXC TPI and KTM 300 EXC TPI models will remain the first choice for ambitious Enduro riders who are looking for an affordable bike with low maintenance costs. guarantees excellent atomization of the fuel with the upstreaming air. This results in highly efficient combustion with significantly reduced losses of unburned hydrocarbons. A small-diameter tube at the back of the cylinder is connected to an intake pressure sensor, which supplies pressure data to the engine management system. of oil for any given conditions, loads and engine speeds is added. The average fuel-to-oil ratio is approximately 80:1. The filler cap assembly for the oil tank is located between the fuel tank and the steering head. Oil flows from here through a hose inside the upper frame tube into the oil reservoir. An automatic, electronically controlled oil pump is also incorporated, which reduces smoke emissions by over 50 per cent compared with the average pre-mix. As a result of the efficient combustion process – a major factor of which is the TPI system – and the precise automatic system, all KTM EXC TPI models comply with Euro 4 emission regulations. Emissions of unburned hydrocarbons have also been reduced significantly and are below the legal requirements. TPI engines are fitted with a 39 mm throttle body made by Dell'Orto. While the power is controlled by the throttle valve, a throttle position sensor provides the engine management system with intake airflow data. A throttle adjusting screw enables the rider to regulate the idle speed. A cold start device is also provided, which opens a bypass to supply more air and thus increase the idle speed. Oil delivered by the electric oil pump via an oil suction pipe is mixed with the incoming air to lubricate the moving parts of the crankshaft and piston. KTM has a strong 6-speed transmission with widely spaced gear ratios matched optimally to the tough requirements encountered in competitive Enduro events, and features fast and smooth gear changing. The KTM No-Dirt gear shift lever design prevents mud and dirt from entering the joint of the lever, ensuring that gear changes are trouble-free. KTM has made a point of positioning the clutch shaft and crankshaft high up in the lightweight, die-cast crankcase and close to the bike's center of gravity. In this way, the manufacturer has centralized the oscillating masses, giving its Enduros excellent agility. The engine features a side-mounted balancer shaft, which keeps engine vibration levels to a minimum and results in a compact powerplant. A major benefit compared to the competitors is the noticeably increased level of comfort, which significantly reduces rider fatigue on long and arduous Enduro multi-day events. All KTM EXC TPI models are equipped with the DDS (damped diaphragm steel) clutch developed by KTM. With its diaphragm spring, integrated damping system, extremely heat resistant clutch plates and a wear-free steel outer clutch hub, this design results in a much easier clutch operation than is the case with conventional clutches using coil springs. At the same time the diaphragm spring leaves sufficient space to integrate the damping system of the final drive into the clutch hub. This has a positive impact on both traction and durability. The hydraulic clutch mechanism from Brembo has a particularly light action, allowing plenty of control when applying the clutch. In order to cover the power requirements of the engine management system, the TPI models are fitted with a powerful generator, rated at 196 watts, just like on the EXC-F 4-stroke models. The engine management system featured in the KTM EXC TPI models incorporates the most advanced technologies fitted in any offroad bike with a 2-stroke engine. The electronic control unit installed under the seat uses various, sensor-based data such as intake and ambient air pressure, throttle valve position and coolant temperature, which are used to determine the optimum ignition timing and the ideal amount of fuel required for the fuel injection system. An additional benefit is that the engine does not need to be set up manually to compensate for changes in prevailing environmental conditions. Using the optionally available map select switch (fitted as standard on the SIX DAYS models), the rider can select a different engine power curve during the race. Offroad racing is really at the core of KTM and the recognizable KTM EXC SIX DAYS models are a real center point of our Enduro line-up. This year's International Six Days Enduro event will be held in Chile and the KTM SIX DAYS models receive a special graphics kit to represent this, along with an impressive package of well-thought out READY TO RACE upgrades for those who want a bike that's as close to factory as you can get.